We awoke to a blanket of fog enveloping Apalachicola this morning. This is a good sign that the weather will be calm for our Gulf Crossing later today. After waiting in Apalachicola for almost a week, we finally have a green light for the crossing. We have been following several weather forecast over the last weak, daily checking the wind and sea forecasts. 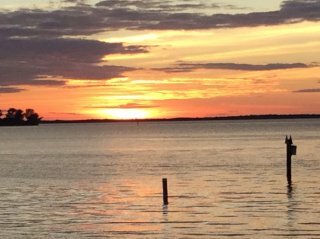 Eddie, a fellow looper who lives along the Gulf, also sends out daily email posts to loopers with his own weather forecast. Having this local knowledge is invaluable. We now have a favorable overnight window for the crossing. We will travel 200 miles crossing the open waters of the Gulf overnight arriving in Tarpon Springs tomorrow. Traveling at 8 MPH, the trip will take about 22 hours. We time the trip for a late morning arrival. It is never good to go into a strange port in the dark. An added concern is the multitude of crab traps lurking just above the surface in the shallow coastline waters. We need good light to spot them. The first priority of the day was a trip to the local bakery. With hot cinnamon rolls and freshly made beignets in hand we head back to IT. BC and Gabby aboard Sandpiper join us for breakfast and coffee to discuss the weather and our plans for the crossing. We all agree that it looks like we will have good weather conditions for the next 48 hours, so the crossing for today is a go. They will shadow us staying 1/4 mile astern for the crossing. Noon comes and the fog is still thick as we ease Idyll Time out into Scipio Creek. We slowly work our way out the channel and into St George Sound. Sandpiper stays close behind due to the low visibility. The fog refuses to lift and our visibility is only a few hundred feet ahead. We announce our position on the VHF every few minutes and sound the fog horn every two minutes. 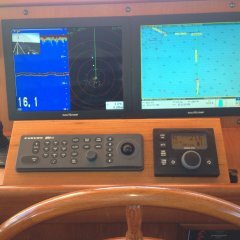 A new complication arose yesterday as we overheard another trawler calling the Coast Guard on the VHF. This boat ran aground just under the St. George Island bridge and Sea Tow was dispatched to rescue them. This channel is part of our route out to the open Gulf and we will be transiting it at low tide. The Coast Guard is now broadcasting a warning every two hours for boaters to exercise extreme caution when transiting this shoal area. 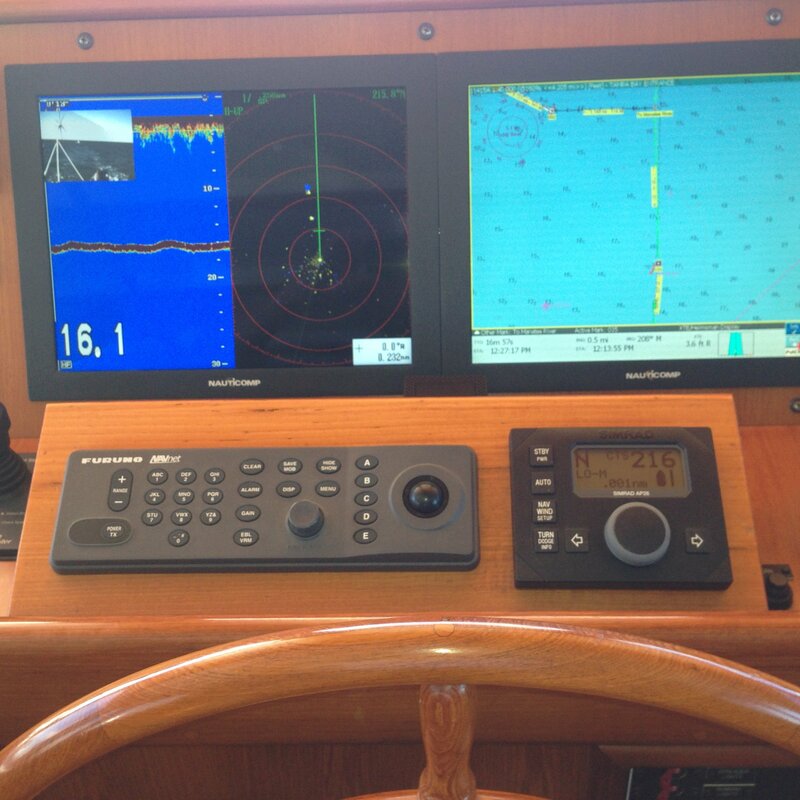 Local knowledge says to stay south of mid channel at buoy 46 and 47. Within an hour of leaving Apalachicola, we reach the shoal area. 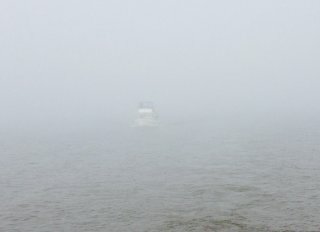 The fog is still thick and we can barely see the buoys ahead. Slowly transiting the marked channel, we stay on the south side as advised and we see no less than 14 ft of water under the keel. We have to wonder if the boat that ran aground was off course. Working our way east along St George Sound, the fog never lifts. Reaching Dog Island and the East Pass we again call out a “Securite” on the VHF announcing our position. The tip of Dog Island appeared for a brief moment as we exited the channel. 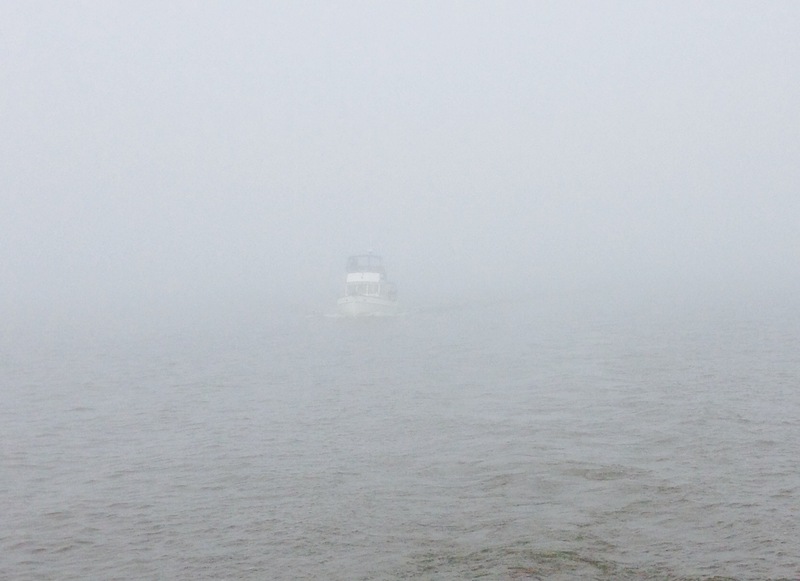 Transiting East Pass between Dog Island and St. George Island is somewhat intimidating with zero visibility. We are constantly monitoring our instruments to avoid the rocky shoals when a target appears on the radar. This boat appears to be headed straight for us. We continue to call out our position on the VHF but the boat doesn’t answer. 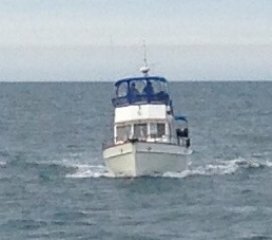 Jeff changes course several times to avoid this boat. Each time our change of course is matched with an equal change by this guy. He appears to be lost. At the last moment, he calls us on the VHF asking where we are. At that moment the boat appears out of the fog right along side our port. He has come to a dead stop while trying to locate us. Thank goodness, that was a close one. Once out in the safety of deep waters, we can finally relax. The seas are amazingly calm and remain so for most of the evening. The dense fog stays with us. Sandpiper remains close on our stern wanting to stay within sight of our running lights. We both settle in for the 170 mile leg to Tarpon Springs. Around midnight, the fog lifts and we are rewarded with a magnificent moon lighting our way towards the Florida west coast. Jeff spends the next few hours watching Ohio State win the National Football Championship on the satellite TV. We alternate watches every two hours although I don’t think either of us slept more than 30 minutes at most. Around 4:00 AM the thick fog returns reducing visibility to zero. We have made good time and are ahead of schedule. After talking with Sandpiper, we agree to alter our course to the west so as to stay along the 60 foot depth contur. By doing so we hope to avoid the crab traps that inhabit the Florida coastline. We also decide to bypass Tarpon Springs and enter Clearwater Pass. By traveling a few more hours we should arrive to the inlet at high tide and hopefully the fog will have lifted by then. A few miles off Clearwater, the winds shift out of the North and we now have a beam sea of 2-3 feet. The stabilizers on Idyll Time get a workout but give us a smooth ride. Sandpiper, unfortunately, does not have stabilizers and their ride is uncomfortable for the next few miles. We are worried about them as their boat rolls from side to side. Once we get close to land, the seas calm and everything is back to normal. 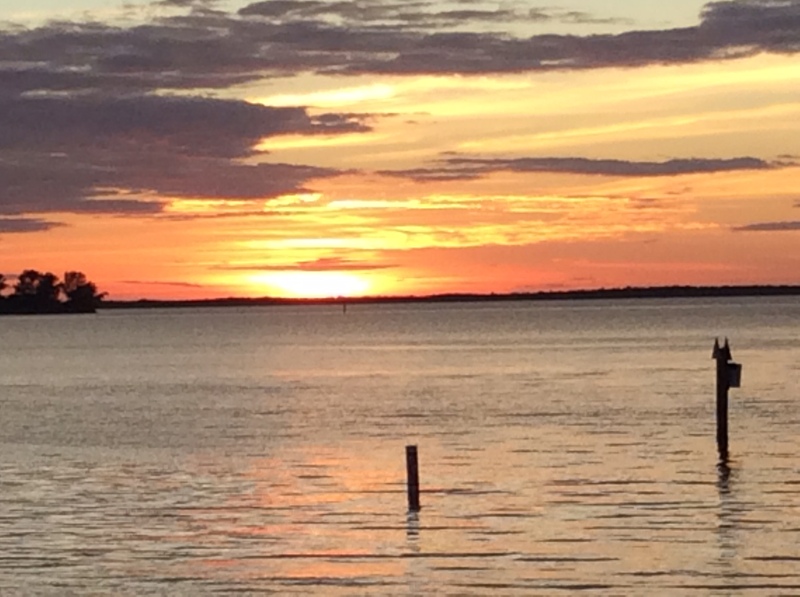 Once inside the inlet, we pick up the ICW traveling north five miles to Dunedin and Marker One Marina. This will be our home for the next week. Now it is time to catch up on some much needed sleep. This entry was posted on January 20, 2015 at 4:17 pm. You can follow any responses to this entry through the RSS 2.0 feed. You can leave a response, or trackback from your own site.